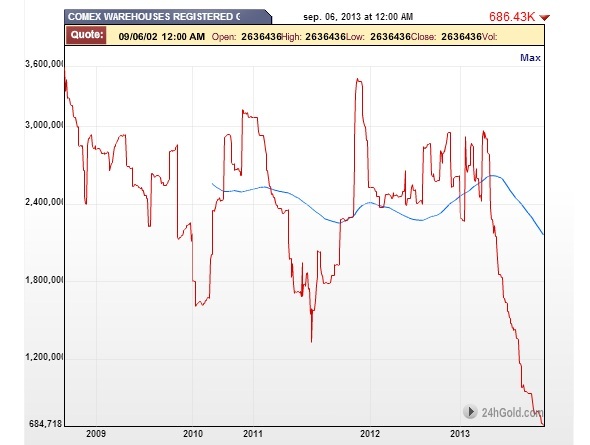 Back in August, the number of claims per physical ounce of gold stored in COMEX warehouses reached 50. That’s 50 owners for every ounce of gold available for delivery. The physical gold rout has continued and the number of owners per physical ounce, now stands at 54.6, a level not seen since 2003. This comes at a time when the global demand for physical gold is rising, led by Asia where Chinese gold consumption is expected to grow 29% this year. 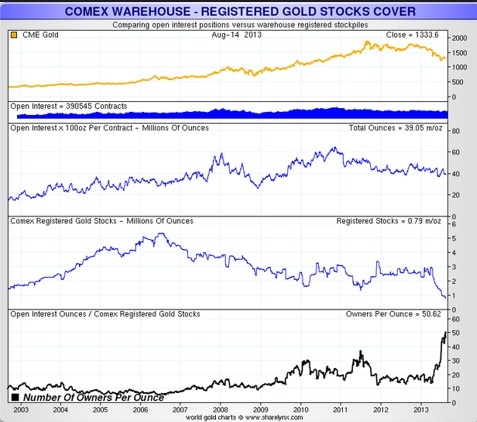 According to COMEX, total registered (deliverable) gold now stands at 686,434 ounces of actual bullion – that is to cover more than 36 million ounces of open interest, or gold ownership. Gold for delivery is running out, which could lead to a rush for the exit – or the mother of all short squeezes.